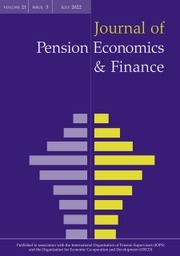 The Journal of Pension Economics and Finance (JPEF) is the only academic journal focusing on the economics and finance of pensions and retirement income. The ageing population, together with the shrinking workforce, heralds a growing pensions crisis, which has become a key public policy issue in developed countries and elsewhere. JPEF provides a valuable and influential forum for international debate in this area. The journal is co-sponsored by the International Organisation of Pension Supervisors (IOPS) and the OECD. JPEF publishes original research papers, covering a variety of topics, including pension fund management, the regulation of pensions, and pensions and labour markets. There is also an Issues & Policy section which includes papers reviewing the state of debate on current public policies and other major aspects of the pensions debate.